Hello, I've installed Edgy and trying to download something from Firefox to a mounted fat32 partition fails. The file is created but the size is 0 bytes. Using flashgot to bypass it (through Kget) I can download successfully the file. It happens with Firefox 2.0 rc2 too. I cannot reproduce this. Downloading something from firefox on a fat32 partition works fine for me using the latest firefox available in Edgy (1.99+2.0rc2+dfsg-0ubuntu1). Tried with 1.99+2.0rc2+dfsg-0ubuntu1 and it's still the same. Saving to my home works. Tried with FF 2.0rc3 and uninstalling all of the extensions I had. It's still the same. When I download to my root partition it goes well, but downloading to a FAT32 partition (/media/Seguridad) leaves the downloaded file with 0 bytes. It happens with firefox 2.0 final too. I can say that the same happens with firefox (default edgy version) when saving to a ntfs partition mounted with ntfs-3g. So this is not an fat32 only bug. Though when saving to /home everything works fine. Patrik Rydberg if this is still a problem please file a new bug report on launchpad. Can anyone else reproduce this? I cant test i have no windows partition. I can't reproduce it myself anmore, it seems the bug has been fixed in some way, at least for ntfs partitions (I don't have any fat32 partition to test it on). Hmm, I have both NTFS and FAT32 partitions, I can save successfully to both. I still have the same problem. When saving to fat32 partition it creates a 0 bytes file and doesn't download anything to it. I could be reading that error wrong but it looks like you dont have correct permissions to save to your fat32 partition are you doing it as root/sudo? I don't think so. I'm running firefox as user as it's configured by default with Ubuntu. I can copy, create and delete files from firefox. Also, I can save files directly in Konqueror. Firefox seems to be the only application having problems with that partition. Sorry, when I said "I can copy, create and delete files from firefox." I had said "I can copy, create and delete files from nautilus"
getaceres are you saying that it works fine in nautilus and doesnt work in firefox? Is this a problem with the latest version in repos? I'm saying that it works well in every other application except firefox, so I think it's related to firefox. As a user, I can write in the fat32 partition in all the applications (konqueror, nautilus, kget, gaim, amarok, even amule and azureus) but not with firefox. It can write because it creates an empty file but instead of filling it, the download ends immediatly and the file is left with a size of 0 bytes. I'm using the latest version and it's still the same. It's happening since the first time I installed Edgy (it was in beta at the time). It didn't happen with Dapper and I haven't tested Edgy yet. I have tried disabling and uninstalling all the extensions, even deleting the .mozilla directory and it still happens. Today I've installed Feisty Herd5 deleting my old Edgy install and I've updated all the packages to the current version. Still I can't save to my FAT32 partitions. I also have this problem (http://www.ubuntuforums.org/showthread.php?p=2328378#post2328378). I also have the same problem: firefox is saving 0 bytes files on fat32, but works perfectly when saving in home folder. Same here. Saving to (ext3) root partition works fine, saving to a FAT32 always leaves me a zero-byte file. And it's not a permissions problem, for I can move the file from ext3 to FAT32 afterwards. I dont know if this message is equivalent to the NS_ERROR_FILE_ACCESS_DENIED error getaceres got in https://bugs.launchpad.net/ubuntu/+source/firefox/+bug/65164/comments/2, since he used an earlier Version of Firefox. I dont quiet get the semantics of this paragraph (for example what the differnce between the two Files is and why they delete the first one), so a cannot say if its a bug or a feature ;). the expression is true and I get a aborted download and a 0 byte file. Watching the network traffic revealed, that Firfox starts donwloading as soon as I left click on a link; seems it is prefetching the download while the user selects the destination. As soon as I click Ok the download stops. Right click -> Save target as... works nicely, as nothing is prefetched and the section in nsHelperAppdlg.js is not executed, but this procedure is not possible for all downloads. 1. Quick and dirty commenting out the above section in nsHelperAppdlg.js. This is not a good idea as long as the meaning of it is unclear, even though I discovered no side effects. 2. Mount the partition with separate dmask and fmask (for example dmask=007,fmask=117). As long as you dont need to execute files on that partition, this is a much cleaner solution than the first. Of course these are just workarounds, so a real fix still needs to be done. other than to look into this :). This error occurs with NTFS (ntfs3g) and Feisty (Firefox 2.0.0.3), too (see my bug https://bugs.launchpad.net/ubuntu/+source/firefox/+bug/105474). I worked around it with solution 2 from above. Epiphany, and it was ok. 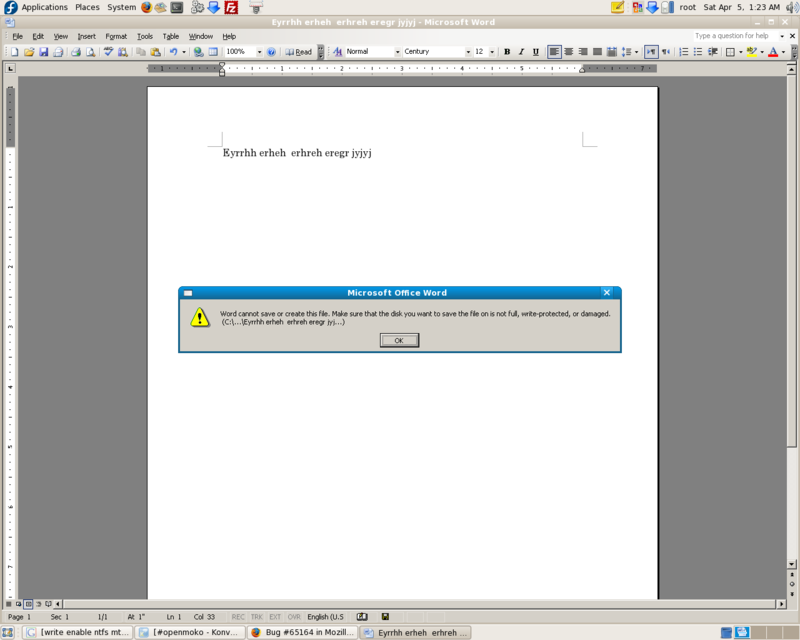 The problem does not occur when I firstly open the file with other program, such adobe reader, and then save the file. If I click directly in a link with right button, and I choose to save, it's ok.
Also, the problem does not occur when I save in my home directory. The problem is for FAT particion. I hope this way you have enough information. this fixes the problem for you too? After commenting the portion of code described above, not only did it solve the 0 byte files problem (on FAT32) but also the doubling of files extensions. For every file I downloaded, an extension was added after the save dialog. This led to files being named ".zip.zip" which apart from being funny was harmless. Unfortunately, other files (rar, exe, ...) obtained a ".bin" and tar.bz2 / tar.gz received another ".tar". tried to delete my profile but the problem persists. i attached a patch in upstream bug. Lets see if they are happy. Then we can apply. as we are now using system nss. moved to distro mods extension by overlays or other tricks. patch from release branch package. submitted to bugzilla (LP: #65164). * Added svedish translations support to firefox's .desktop file. Yes, I have the exact same problem when I'm trying to save a file to a windows ntfs partition with Firefox in Fedora Core 8. I'm logged in as root, and I can do everything on that partition with other programs, only firefox makes a 0 bytes file. Something to cheer I hope. I too have the same issue with file being saved as empty file. Surprisingly it is not only Firefox. Even Microsoft Word on Wine couldn't save/ saved a document with 0 bytes. It can be concluded that this may be an OS issue. The above is for my hda. One can get the above info by 'fdisk -l' and add appropriate entries. I guess the issue may be with the HAL daemon. It tries to detect these partitions but not able to give write permissions to applications on them. similar problem I'm having using ubuntu karmic beta, firefox 3.5 (shiretoko 3.5.4pre).